One of our most used (and now falling apart) cookbooks is The Earthbound Farm Organic Cookbook, Food to Live By. There is a joke behind this; at least, it is funny to Mark and I. A number of years ago we discovered we liked to cook together. Then we decided, “hey! 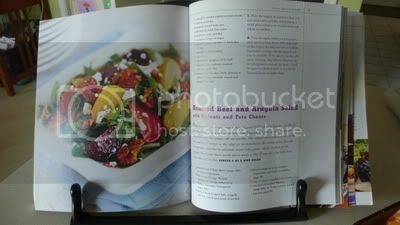 We should be healthy about this!” To that end, I purchased two cookbooks without much research. The first was Super Natural Cooking, or, as I first called it “the tofu and tree bark book.” It turns out it is a terrific book; we’ll be trying a new recipe from there later this week. The second was the aforementioned Food To Live By. We quickly learned that though “organic” is in the title, these were not all low calorie, low fat recipes. One of the first we made was the macaroni and cheese recipe…it was delicious in all its creamy, fatty goodness. Food to Live By has so many delightful recipes. We haven’t had one yet we didn’t love. Myra Goodman shares the family recipes, tips on everything from buying produce to storing it, and also includes stories from their farming life. Since Mark and I are on this running streak, we have (finally) returned to better meal planning and better menus. One of the picks this week was the Roasted Beet and Arugula Salad from Food to Live By. We chose that one, and one from the other book mentioned here. I decided that since I not only work all day on Monday, but also now have rehearsals Monday evenings, I’d choose the “easier” of the two and make the salad on Monday. Aaaand…another mistaken assumption about this cookbook. Just because it is a salad, one should never assume it could be simply tossed together (pun intended). To begin with, the recipe also included two references to two separate recipes…one for the candied walnuts to top the salad, the other for the dressing. Making our own candied walnuts was SO worth it. It was also the first time I’ve had the occasion to use Chinese Five Spice. What a warm, happy spice medley. Reminded me of the holidays. The dressing, while labor intensive – fresh squeezed oj anyone? – was so very worth it. Another first, we now have walnut oil in our cabinet. After peeling and quartering the beets, and then bleaching the counters and my fingers, they were tossed in olive oil, kosher salt and pepper, and thrown in the oven. Having dual ovens was very handy since I did absolutely no prep work and had to roast the beets and the walnuts simultaneously. After all of that, I noticed the part of the recipe that said you could do all of those things one day in advance, if desired. Lesson learned. Moving along, we dressed the greens and peeled the oranges and segmented them. I say “greens” because I was unable to locate arugula alone and ended up purchasing a mix of arugula, spinach, and radicchio, it was yummy all the same. I mean that, this was quite possibly the best salad I’ve ever had. The dressing, Orange Walnut Vinaigrette, keeps for up to one month in the refrigerator, so I am sure this salad will be making its way back on to our table soon. 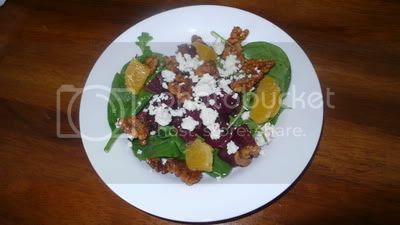 One other quick note, of the ingredients to the salad: greens, roasted beets, candied walnuts, orange segments, and feta cheese, can you guess which one was the hit with our 4 year old? If you guessed the beets, you are correct. I did not think those would go over as well, and yet she requested seconds! I think my salad turned out almost as pretty as theirs. If you are interested, the cookbook again is: Food to Live By by Myra Goodman with Linda Holland and Pamela McKinstry, ©2006 Workman Publishing Company, Inc.